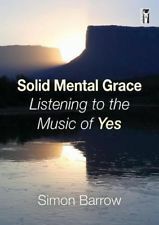 THE penultimate chapter of Solid Mental Grace is somewhat provocatively entitled “Yes after ‘progressive rock’.” That’s because part of the purpose of the book is to look at what happens when we allow an encounter with music to question the categories and labels which are often used to introduce or summarise it, but which can equally become a barrier to open-minded receptivity. In the case of Yes, my experience is that a good number of those who dismiss the band’s output do so on the basis of prior decisions about what kind of music it is, and assumptions about the baggage a category such as ‘progressive rock’ brings to it. Labels are, of course, unavoidable — especially when we want to locate something in a cultural space or a transmitting marketplace. But they can also be highly misleading or inhibiting, and so need to be open to constant challenge and review in order to make sure that they are not preventing the music itself from reaching out to fresh ears and speaking on something approximating to its own terms. Part of my argument in Solid Mental Grace is that ‘progressive rock’ is often unhelpfully thought of as a sub-genre of a particular type of music, whereas it might more helpfully be considered as an invitation to the kind of musical creativity that presses the boundaries of a received form (in this case, rock) by stretching out to embrace styles, textures, ideas and possibilities developed within other allied musics, as well as within the domains of experimentation or extemporisation less common to the root form. In these terms, I point out, only some of Yes’s musical output over the past 50 years could be meaningfully designated ‘progressive’. Indeed, the notion of ‘progress’ in music is a fraught and contested one in its own right, attached as it is to notions of development which have proved far too linear and goal-oriented. Music is surely about a journey, not a destination. So perhaps the terminology of ‘rock-based fusion’ is more helpful in relation to what, if it is taken as a sub-genre, is invariably “heterogeneous and troublesome” (Paul Hegarty and Martin Halliwell, Beyond and Before: Progressive Rock since the 1960s, Continuum / Bloomsbury, 2011). But this still leaves the notion of ‘creativity’ relatively undeveloped. Thankfully, ex-Yes (and King Crimson and Earthworks) drummer Bill Bruford, fresh from his PhD research and studies at the University of Surrey, has been devoting a good deal of ‘retirement’ time and energy to considering precisely that question. In particular, I have recently been reading his immensely stimulating new book, Uncharted: Creativity and the Expert Drummer (University of Michigan Press, 2018), and considering his October 2017 lecture at Edinburgh Napier University on creativity in popular musical performance (YouTube video). Both are thoroughly recommended, though not for the feint-hearted. In fact I had not seen either before I wrote my “Yes after ‘progressive rock'” chapter. If I had it would have been better, I’m sure. On the other hand, I had already sternly abbreviated earlier drafts of the book which started to veer too much into the realm of formal analysis, and overall I’m glad that I resisted that trajectory. So my comments on creativity in relation to the music of Yes (which can be found throughout Solid Mental Grace, not just in that particular part of it) are far less developed than they might be. But I hope they are nevertheless helpful as signposts for people who want to explore the music more extensively. I might well come back to Bill’s illuminating reflections and theses on creativity and artistic expression at a later date. In the meantime, fear not: this blog will not be all theory! It will also contain images, comments, provocations and ideas about Yes and their music in much lighter vein, I hope. But this is the particular topic that was running through my mind when I considered a first, reasonably substantial post… so there you go.